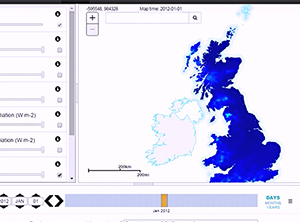 Long-term records of daily weather variables over the UK since 1962 have been re-processed to produce a 1km gridded meteorological and land state dataset for Great Britain, now publicly available through CEH’s Environmental Information Platform. The dataset, called CHESS (Climate, Hydrological and Ecological research Support System), currently consists of daily mean meteorological variables. It draws largely on MORECS data (temperature, humidity, wind speeds and sunshine hours) downscaled to 1km resolution using information about the impact of topography, such as hills and mountains. 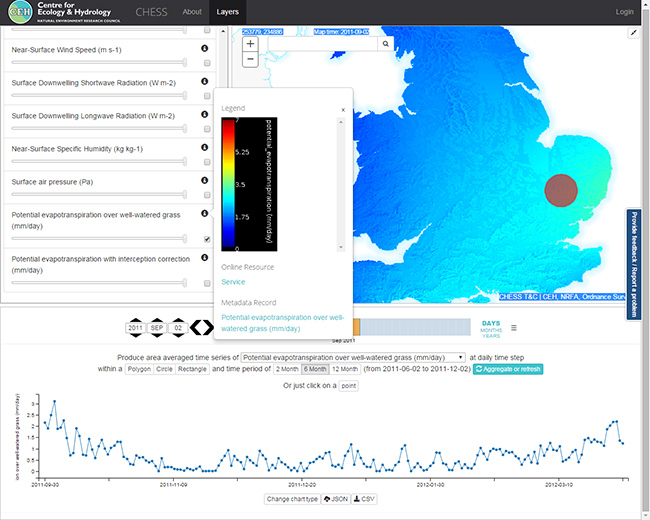 It can be used with the CEH GEAR rainfall dataset to drive other models such as the UK Land Environment Simulator (JULES), or to identify meteorological-causal links with the environment of the UK. The dataset is freely available for download and use for research purposes. Additional model-derived variables of soil moisture, soil temperature, evaporation and sensible heat flux will soon be available. These are generated by the JULES model, also on a daily timestep, in response to the meteorological data. The CHESS Explorer application provides the ability for users to preview the data, visualise maps of the different variables, and understand how they vary across the country and through time. Web-services are available to enable the integration of CHESS data within other applications. A number of universities have already accessed the data. As well as being freely available for research purposes, commercial use is also available under licence. The CHESS Explorer is available here. The additional CHESS model outputs will be available soon.